Faces From the Past: Forgotten People of North America by James M. Deem. Review: "When the earliest settlers died, so long ago, they were buried in caves or isolated graves. Later, others built burial mounds or cemeteries for their dead. Over time, many of the mounds were robbed and destroyed. Many early cemeteries disappeared from sight when makeshift grave markers blew away in the wind or decayed. No matter how they died, as time passed these people were forgotten." The book, Faces from the Past by James M. Deem, includes ten different nonfiction stories such as a selection about a Native American with dental problems and another story of a French sailor miles away from home. In Faces from the Past, all the bodies or groups of bodies were found in different ways. After the initial discovery of each body, archeologists would carefully remove the body, making sure not to damage the skeleton, and quickly study the remains. Sometimes they would also examine the coffin to help estimate how long ago the person died. As soon as the archeologists completed their examination, the skeleton would be sent to a group of anthropologists. Subsequently, the anthropologists would take their time studying the remains to determine details such as age, height, ancestry, and other information. In certain cases, the anthropologists asked sculptors to reconstruct the face of a skeleton they had found so that people could see what these people from long ago had looked like. In my opinion, this book should be given five out of a five star rating because it does not just state information about the bodies that are found, it also provides much additional information. Historical information about the time of the person's death is always given. Additionally, at the beginning of every story, there is a paragraph about interesting things that scientists have determined happened to the person shortly before and after he or she died. Another reason for my rating is the excellent writing. Deem was very descriptive and clear in his writing. For example, in the sentence, "Although the fabric had disintegrated and the coffin wood had rotted, archeologists were able to find pieces of cloth and wood, handmade iron coffin nails, and small brass straight pins that had fastened the burial shrouds" he described the coffin very well and I easily created a vivid image in my head. I would recommend this book to both boys and girls 12 years and older because of the advanced vocabulary that Deem often uses. Overall, this book is a great read, and I encourage you to check it out too! 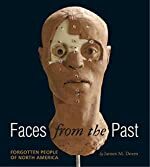 We would like to thank Houghton Mifflin Harcourt for providing a copy of Faces From the Past: Forgotten People of North America for this review. Have you read Faces From the Past: Forgotten People of North America? How would you rate it?